කථානායක කරු ජයසුරිය විසින් හෙට (14) පෙරවරු 8.30ට විශේෂ පක්ෂ නායක රැස්වීමක් කැඳවා ඇති බව කථානායක කාර්යාලය නිවේදනය කරයි. ශ්‍රේෂ්ඨාධිකරණය ලබාදුන් අතුරුතහනම් නියෝගය මත පාර්ලිමේන්තුව හෙට (14) රැස්වීමට බාධාවක් නැතැයි එක්සත් ජාතික පක්ෂයේ පත්කළ පාර්ලිමේන්තු මන්ත්‍රී ජනාධිපති නීතිඥ ආචාර්ය ජයම්පති වික්‍රමරත්න මහතා ලංකාදීපයට පැවැසීය. ජනාධිපතිවරයා පසුව නිකුත් කළ ගැසට් නිවේදනය අවලංගුව පවතින අවස්ථාවක ජනාධිපතිවරයා විසින් ඊට ඉහතදී නිකුත් කළ ගැසට් නිවේදනය වලංගු වන බවද ඔහු කීය. ඒ අනුව ජනාධිපතිවරයා පාර්ලිමේන්තුව හෙට (14) පෙරවරු 10 ට කැඳවමින් නිකුත් කළ අතිවිශේෂ ගැසට් නිවේදනය වලංගු වන බවද ජයම්පති වික්‍රමරත්න මහතා පැවැසීය. ජනාධිපතිගේ පෙර ගැසට්ටුව අනුව කතානායකතුමා පාර්ලිමේන්තුව හෙට කැඳවයි..! ගරු ජනාධිපතිතුමන් නිකුත් කරන ලද 2018 නොවැම්බර් 04 දිනැති අංක 2095/50 දරණ ගැසට් නිවේදනය ප්‍රකාරව හෙට (2018.11.14) පෙ.ව. 10.00ට පාර්ලිමේන්තුව රැස්වන බව ගරු කතානායකතුමන් දන්වා සිටී. ඒ සඳහා සහභාගී වන ලෙස සියළුම පාර්ලිමේන්තු මන්ත්‍රීවරුන්ට ගරු කතානායක තුමන් දැනුම් දෙනු ලැබේ. ECONOMYNEXT - Sri Lanka's Supreme Court has suspended the dissolution of parliament by President Maithripala Sirisena, granting interim relief, lawyers said. The gazette has been suspended till December 07 in interim relief. A three judge bench headed by Chief Justice heard petitions from several parties. Lawyer M Sumanthiran said as a result of the case Parliament will meet tomorrow at 10.00 am. The court also granted leave to proceed and will hear the case in the first week of December. AFP - Sri Lanka's Supreme Court on Tuesday overruled President Maithripala Sirisena's dissolution of parliament and ordered a halt to preparations for snap elections next year. Wickremesinghe's party led the petitions against the dissolution and the three-judge bench, headed by the Chief Justice Nalin Perera, read out the decision to a packed court guarded by hundreds of heavily armed police and commandos. The ruling means parliament could go ahead with a vote to test if Sirisena's controversial nominee is able to summon a majority in the 225-member assembly and force Wickremesinghe from office. ECONOMYNEXT - Sri Lanka's Speaker, Karu Jayasuriya has asked members to convene to determine the legitimacy of a government and asked the public and officials to abide by the decisions of court and parliament after courts suspended a sacking of the Parliament by President Maithripala Sirisena. "After several days of political uncertainty, the public can take pride in our judiciary, which has risen to the occasion and treated this matter of grave national importance with due urgency and deliberation," Speaker Jayasuriya said in a statement. "Parliament must now perform its role by allowing the elected representatives of the people to reach a determination on the legitimacy of their government. "I urge the public to find comfort in the day's events and to share my confidence in our elected representatives. :It is important that the general public and especially persons in positions of responsibility conduct themselves in a calm and dignified manner in order to avoid unnecessary provocation and instability. "I ask all Sri Lankans to peacefully accept the determinations of the judiciary and Parliament." Over the last two days, The Supreme Court of the Republic of Sri Lanka heard arguments in several petitions challenging the 9th November 2018 Proclamation that purported to dissolve the 8th Parliament of Sri Lanka. Earlier this evening, the Supreme Court made interim order suspending until 7th December 2018 the operation of Extraordinary Gazette Notification Number 2096/70 by which the President sought to dissolve Parliament. 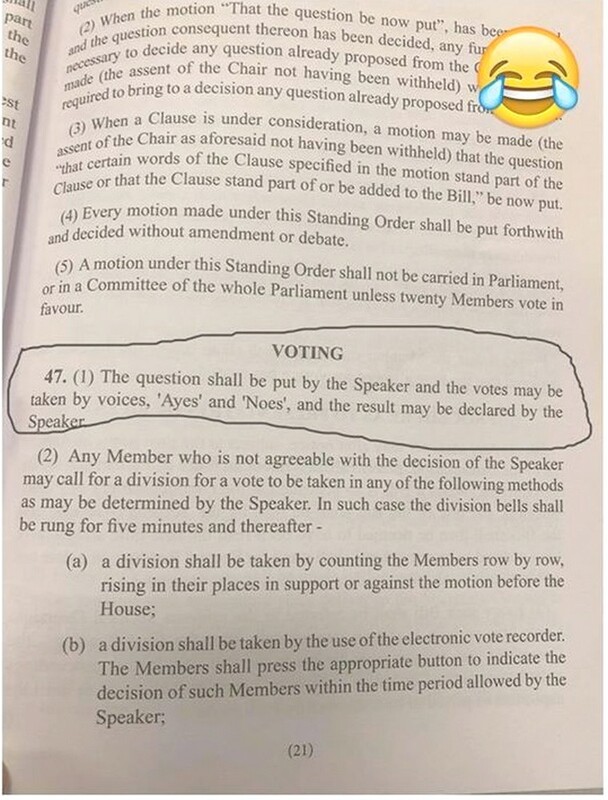 As this order by The Supreme Court renders the Gazette Notification ineffective, Parliament is bound by the previous Extraordinary Gazette Notification Number 2095/50 dated 4th November 2018 by which the President summoned Parliament to convene at 10:00 AM on 14th November 2018. I have discussed this development with the Secretary-General of Parliament and several party leaders. A party leader's meeting will be held in the Parliament Complex at 8:30 AM tomorrow, 14th November 2018. Thereafter, Parliament shall convene at the Chamber of Parliament at 10:00 AM in accordance with the Proclamation issued by the President per Extraordinary Gazette Notification Number 2095/50 dated 4th November 2018. After several days of political uncertainty, the public can take pride in our judiciary, which has risen to the occasion and treated this matter of grave national importance with due urgency and deliberation. Parliament must now perform its role by allowing the elected representatives of the people to reach a determination on the legitimacy of their government. I urge the public to find comfort in the day's events and to share my confidence in our elected representatives. It is important that the general public and especially persons in positions of responsibility conduct themselves in a calm and dignified manner in order to avoid unnecessary provocation and instability. I ask all Sri Lankans to peacefully accept the determinations of the judiciary and Parliament. AFP - Sri Lanka's Supreme Court on Tuesday overruled President Maithripala Sirisena's dissolution of parliament in a major boost to sacked prime minister Ranil Wickremesinghe's fight to reclaim the post from an arch-rival. The heavily guarded court also halted preparations for a snap election in the latest twist in a power struggle that began when Sirisena dismissed Wickremesinghe on October 26 and replaced him with former strongman president Mahinda Rajapakse. ECONOMYNEXT - Speaker Karu Jayasuriya has called members of Sri Lanka's Parliament to meet on November 14 at 10.00 am after the island's Supreme Court suspended an order by President Maithripala Sirisena, dissolving the house. Before the purported sacking, President Sirisena recalled parliament which was earlier suspended to give him time to buy over legislators loyal to Ranil Wickremesinghe. Speaker Jayasuriya said according to President Sirisena's proclamation recalling parliament, the house will meet at 10.00 am tomorrow. "The Speaker is informing all members of parliament to attend the session," the Speaker said in a statement. President Sirisena was expected to make a policy statement on with the commencement of the new sessions. Speaker Jayasuriya had also asked for floor test to determine whether Ranil Wickremesinghe, who was controversially sacked, or the new contested Prime Minister Mahinda Rajapaksa had the confidence of the majority of members. Puduma aathal ekak denne ape hitan. Thawa thurumpu ethi man hithanne. Most probaly kawata andare will be replaced. ආණ්ඩුවට එරෙහිව විශ්වාස භංග යෝජනාවක් බදාදා පාර්ලිමේන්තුවේදී සම්මත කෙරුණු බව දන්වමින් කතානායක කරු ජයසූරිය විසින් තමන් වෙත එවන ලද ලිපියට ජනාධිපති මෛත්‍රීපාල සිරිසේන විසින් ලිඛිත ප්‍රතිචාරයක් දක්වා තිබේ. "ඔබතුමා මාවෙත එවන ලද ඉහත කී ලිපියේ යෝජනා අංක 1 මගින් දක්වා ඇති කරුණ, එනම් එහි සඳහන් පත්වීම සහ නියෝග ආණ්ඩුක්‍රම ව්‍යවස්ථාවට පටහැනි බවට දක්වා ඇති ප්‍රකාශය, මා තරයේ ප්‍රතික්ෂේප කරමි. එම අංක 1 යෝජනාවේ මා ගත් ක්‍රියා මාර්ග ආණ්ඩුක්‍රම ව්‍යවස්ථාවට එකඟ නීතිමය තීරණයන්ය," යනුවෙන් ජනාධිපතිවරයා විසින් කතානායකවරයා වෙත යවන ලද ලිපියේ දැක්වේ. "මා විසින් නිකුත් කළ ගැසට් නිවේදනයෙහි ව්‍යවස්ථානුකූලත්වය තීරණය කිරීමට පාර්ලිමේන්තුව වෙර දැරීම ආණ්ඩුක්‍රම ව්‍යවස්ථාව අර්ථනිරුපනය කිරීමට ශ්‍රේෂ්ඨාධිකරණය වෙත පැවරුණු තනි සහ අනන්‍ය බලය අතික්‍රමණය කිරීමක් බව ද, එයින් ඔබතුමා ආණ්ඩුක්‍රම ව්‍යවස්ථාව දෙස අවධානය යොමුකර නොමැති බවද පෙනේ." Like a lot how you arranged here, multiple news items with clickable links. තමන් ව්‍යවස්ථාව කඩවන අන්දමේ කටයුත්තක් නොකරන බවත්, ඒ අනුව නැවත පාර්ලිමේන්තුව කල් දැමීමට අපේක්ෂා නොකරන බවත් ජනාධිපති මෛත්‍රීපාල සිරිසේන බ්‍රහස්පතින්දා (නොවැම්බර් 15) සවස පක්ෂ නායකයන් සමග පැවති හමුවේදී ප්‍රකාශ කළ බව රාජිත සේනාරත්න මන්ත්‍රීවරයා බීබීසී සිංහල සේවයට පැවසීය. බදාදා ඉදිරිපත් කළ විශ්වාස භංගයේ පළමු කරුණ තමන්ට එරෙහිව ඉදිරිපත් වූවක් බැවින් සහ පිළිගත නොහැකි කරුණක් බැවින් අලුත් විශ්වාස භංග යෝජනාවක් ගෙන එන ලෙස ජනාධිපතිවරයා මෙම හමුවීමේදී පක්ෂ නායකයන්ගෙන් ඉල්ලීමක් කර තිබේ. නැවත විශ්වාස භංගයක් ඉදිරිපත් කර සම්මත කරගන්නේ නම් එය පිළිගැනීමට තමන් සූදානම් බව ජනාධිපතිවරයා සඳහන් කළ බවත් රාජිත සේනාරත්න මන්ත්‍රීවරයා පැවසීය. එබැවින් සිකුරාදා (නොවැම්බර් 16) නැවත වතාවක් විශ්වාස භංග යෝජනාවක් ඉදිරිපත් කරන බව ද ඔහු පැවසීය. බහුතර පාර්ලිමේන්තු මන්ත්‍රීවරු තමන් පත් කළ අග්‍රාමාත්‍යවරයා පිළිනොගන්නේ නම් ඒ අනුව කටයුතු කරන අතර, එක්සත් ජාතික පෙරමුණට පාර්ලිමේන්තුව තුළ බහුතර බලය තිබෙන්නේ යයි තමන් පිළිගන්නා බවත් ජනාධිපති මෛත්‍රීපාල සිරිසේන පැමිණ සිටි පක්ෂ නායකයන්ට දැනුම් දී තිබේ. පාර්ලිමේන්තුවේ බහුතරය පෙන්වා සිටියහොත් ඒ අනුව ව්‍යවස්ථානුකූලව කටයුතු කළ හැකි බව ජනාධිපති මෛත්‍රීපාල සිරිසේන මහතා එක්සත් ජාතික පෙරමුණේ සහ දෙමළ ජාතික සන්ධානයේ නියෝජිතයන්ට අද සවස දැනුම් දුන් බව ජනාධිපති මාධ්‍ය අංශය කියයි. පාර්ලිමේන්තුවට ඉදිරිපත් කළ විශ්වාස භංග යෝජනාවේ පළමු වගන්තිය ඉවත් කර යළිත් වරක් හෙට දිනයේ එය පාර්ලිමේන්තුවට ඉදිරිපත් කිරීම ගැන අවධානය යොමු වූ බවත්, එහි දී නමින් ඡන්දය විමසන ලෙස ජනාධිපතිවරයා ඉල්ලා සිටි බවත් ජනාධිපති මාධ්‍ය අංශය සඳහන් කරයි. Yesterday's gathering at Lipton circus and what was demonstrated at the meeting has given shock waves to MS. The reason why he had called the evening meeting was that. He had agreed to accept today's count on NCM by name or show of hands or voice & noise and accept the majority as declared. By evening today, he will appoint the PM and it will be SP as per RWs request. (But keep your fingers crossed knowing the irrational behaviour of the man we are dealing with). yes most probably sajith will be appointed. JVP or TNA has to vote as a coalition partners of the govt that is going to be formed in order to show the majority. otherwise again it will be a minority government. 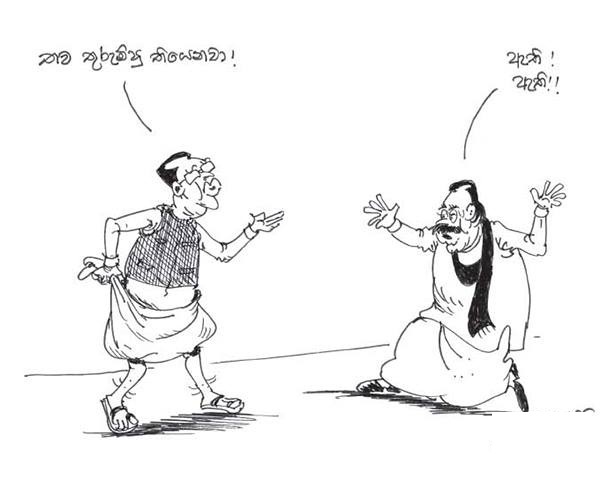 jvp might join with unp to form a government. 6 - Does the Modi government’s RBI spat mask desperation? ECONOMYNEXT - Sri Lanka's President Maithripala Sirisena had asked party leaders who supported a vote of no confidence against disputed Prime Minister Mahinda Rajapaksa to show their majority with a name count, a statement said. Speaker Karu Jayasuriya had already declared that Rajapaksa is no longer Prime Minister following a vote of no confidence two days ago and there was no Prime Minister in the country. The motion also declared that gazettes appointing Rajapaksa as Prime Minister, and sacking Ranil Wickremesinghe was also null and void. Legislators loyal to Rajapaksa blocked taking a name count and disrupted proceedings. President had asked for the references to gazettes to be removed in any new motion, the statement said. It is however not clear whether the President is asking for a motion already taken to be undone. A legal analyst also question whether a motion of no-confidence can be moved against a person who has already been voted out of office and is no longer Prime Minister. Earlier on Thursday, a motion of no-confidence was moved against a speech made by Rajapaksa in parliament.